Every Surface Becomes a Canvass! 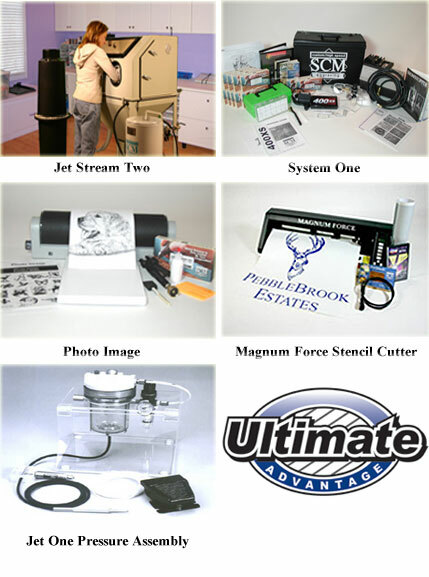 If you are looking for a system that can do it all..The Ultimate Advantage is for you! Tungsten-Carbide nozzle, 40lb professional grade hopper-mounted pressure system, foot control bladder assembly for instant on/off operation, abrasive grit (recyclable), dual filtration dust collector, heavy duty Jet Stream cabinet, large viewing window, easy access side door. 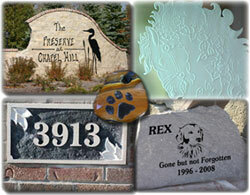 The Jet Stream Two system has been designed, engineered and manufactured to allow you the flexibility of producing highly detail designs like pet memorials to deeply carved stones like subdivision signs. 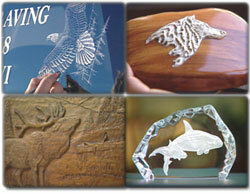 You will also have the capability of etching onto glass, metal, wood, and tile. Exclusive DVD Training Program� , and Instructional Manual is also included. This world-class designed cutter has a heavy-duty servo motor drive for cutting thick blast masks. This system also gives you the accuracy to create larger designs and long production runs. The Quad Grip Roller System with tungsten carbide grips, holds the heavy weight blast mask in precise alignment. Its 500 gram force downward pressure creates consistent cuts and its unique material saver mode will allow small pieces of material to be cut so there is no waste. It will come with Windows based software for total in house creation of artwork, USB connection for fast cuts and production run capabilities, and panalization function for unlimited size projects. SCM's Exclusive DVD Training Program � and Instructional Manual is also included. Exposure system, Photo Image film (3mil 10 sheets for high detail), application adhesive, trigger jet, Photo Image instructions, art library, and vellum. SCM's Photo Image System combined with the Photo Image Film offers you the ability to create beautiful laser quality etched designs on almost any surface. No tedious hand cutting is needed. 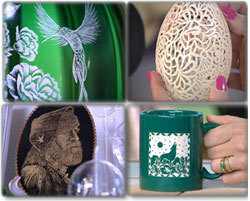 Now you can produce highly detailed stencils that can be lightly etched or deeply carved into glass, stone, wood, metal, ceramic or almost any hard surface. You will have total in house capability to create one of a kind designs or mass production. You control the process. The equipment is so easy to use; anyone can use this regardless of artistic talent. You will be able to create beautiful designs right from the start. SCM's Exclusive DVD Training Program� is also included. 400xs high speed engraver, artwork, exclusive stencil system, automatic moisture release, air control pack, safety goggles & respirators, the upgraded full bits of diamond & carbides, handpiece cradle, foot control, cleaning stone, professional carrying case, stencil remover, finishing brush, bit box, drill case, SCM training manual & business guide and also SCM's Exclusive DVD Training Program is included. This system is unique because there is little to no masking required. You will receive a light weight, easy to control pen with two premium long lasting quick release carbide tips, self-contained regulator and automatic moisture trap assembly, lightning fast on/off foot pedal to control the air flow to the hand piece for precise control, and SCM's Exclusive DVD Training Program is also included. finest carving debris will be collected. Overall dimensions are 8" x 10 3/8" x 23"
baseball and other sports, knives, gun stocks, perfume bottles, holiday, corporate awards, and scrimshaw. Over 400 pages of artwork, designs, names, dates, times, and excellent marketing ideas. This extensive volume covers weddings, holidays, special events, engraving tips, baseball marketing, and many more areas. Professional brochure to aid in your sales presentation. This will be perfect for the wedding, gun, knife, and egg markets. SCM will also provide you a listing of supply sources so that you won.t have to go out and look for your engravable items. This list will include those hard to find wholesale suppliers of, stone, jet black granite, slate, glass, wood, crystal, awards, plaques, and other gift items. These sources will provide you with the best products at the best prices. SCM is your lifeline to these almost impossible to find wholesalers and manufactures. You buy direct with no middleman mark-up. A Car is Stolen Every 20 Seconds! With auto theft on the rise, businesses that focus on theft prevention are becoming more successful. This has made the Silent Security System extremely profitable for those individuals looking for a business of their own and established companies looking for additional services. This package will give you the tools to engrave the vehicle identification number (VIN) in the corner of every window of the automobile. You will learn that when a car thief steals your car, the first thing they do is change the VIN. Now that the number is permanently engraved in the window, they have to change every window! This is a very time consuming job (6-8 hours), not to mention the cost ($1500). The thief will move on to an unmarked vehicle. Lettering Machine - This portable computer produces letters, numbers, and designs for easy setup. Instructional Manual - For identification on vehicle, home, and business. Vehicle Stickers - Adhesive stickers for marking cars. Warning Stickers - These are placed at the entrance of buildings and homes. Carrying Case - Attractive case to carry your materials. This package is what SCM is known for. Why reinvent the wheel. SCM has been in the personalization business since 1988. You will benefit from our experience and the 1,000's of satisfied customers worldwide. The guide will take the mystery out of marketing your products and services in the personalization business. This guide is priceless. This is a comprehensive manual that will help you start your personalization business. SCM's step-by-step guide shows you how to start your business and gives you pricing guidelines on what to charge for your products. SCM will go thru hundreds of products and provide guidelines on wholesale and retail prices. You will know what you should be charging per hour, along with giving you guidelines on how to approach the most popular types of prospects and businesses. 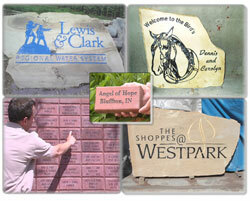 A sampling of the popular markets included are: personalizing rocks (pet memorials, river rocks, address markers), weddings, wine bottles, large glass panels, gifts, awards, wood, on site jobs, plus many more. SCM has an extensive DVD training program for you. Our training DVD's will take you thru every tip and trick of our trade. There will be no guessing on how to set up your equipment or how to use it. SCM's extensive training DVD's will walk you through all the needed steps on how to deeply carve a river rock to a finely etched champaign flute. 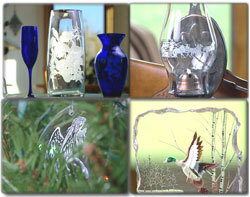 You will learn the beautiful technique of multi-stage carving deeply into glass and even how to sandblast portable. Each technique is different and SCM's expertise is shared with their customers in the unique training DVD's. The DVD will take you thru where to place your system, the proper settings, how to etch into glass, stone, wood and metal. SCM will show you how to add color to your projects for display items or projects that are going to stay outdoors. We also show you how to finish off your project for presenting it to your customer. You will receive over 2 hours of valuable instructions that is a must!!! The SCM newsletter will keep you up to date on the latest trends in the Personalization business. We keep you informed on new techniques on how to produce products faster and new ideas on the hot markets that will keep you ahead of the game. We will keep you informed on new equipment and products that SCM develops. There is also technical information that will help you in your marketing efforts on pricing and promoting. SCM's marketing support line is a valuable service to aid our customers in pricing and promoting their services. This service includes how to price and promote your services. All you have to do is call. Lets say you have to quote a customer for a large project and you want to be sure you are going to give the proper price. Just give SCM a call and we will walk you thru every step so that when you present your price you will be confident you are not to high or to low. This confidence will show in your presentation. This support will help you in the beginning steps, until your business has grown to a successful, prosperous endeavor. NOTE: AN AIR COMPRESSOR RATED AT 8CFM AT 90PSI OR HIGHER IS REQUIRED TO OPERATE THE SYSTEM. NOT INCLUDED.